We are a leading Manufacturer of reel to sheet cutting machine, automatic sheet cutting machine, reel to sheet cutter for a4 a3 paper production and ajya manual roll to sheet cutter from Mumbai, India. Automatic Sheet Cutting Machine for Plastic, Paper, Aluminium, Rubber, Gasket, Fabric etc. 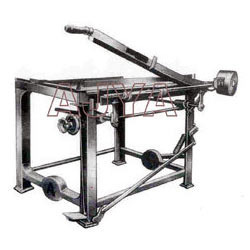 Ajya Mistry And Sons Manufactures variety of Machinery for Automatic Sheet Cutting. Available in Manual, Semi Auto and Automatic Grade for different applications. Machines can be customize to suit individual need of customers. Reel to Sheet Cutting Machine For cutting Paper from 60 GSM to 270 GSM. A4 , A3 Sizes can be cut on Machine from Reel. Machine is equipped with Slitter for First slitting reel in required numbers. Then PLC based control panel cuts the reel at desire length. Paper Roll To Sheet Cutting Machine for Various Sizes. Available from 40" to 60" Working. Six Set Of Male Female Rotary Shear Type Cutters for Slitting. Only Slitter and sheeter or Slitter and Rewinder available. 2 HP Three Phase Electric Motor for Sheeter. 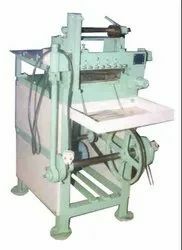 This is Manual Machine for converting to sheet from Roll Form. It is equipped with Right angle gauge and Length cutting Gauge for accurate length cutting. Available in Heavy and Light Duty models with Working cutting width from 12" to 96". Built with hight precision and accuracy for long use with high accuracy. We are also providing Reel Stand for holding roll for cutting with Machine. Looking for Sheeting Machine ?